Samsung Flow is a neat Windows 10 app that lets Galaxy TabPro S users unlock their device using a compatible Galaxy smartphone’s fingerprint reader. It’s limited to Galaxy TabPro S as of now, but consumers using other Windows 10 PCs are impressed by what the app has to offer, and are demanding Samsung to release it to for other Windows 10 devices. The company has now confirmed that it plans to release Samsung Flow for non-Samsung Windows 10 devices in the future. 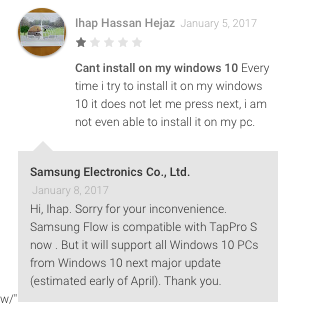 Samsung support confirmed in reply to a consumer query that the Samsung Flow app would be released for all Windows 10 PCs after the next major Windows 10 update (estimated early April). Apart from fingerprint authentication using a Galaxy smartphone, the app also lets users check their smartphone notifications and reply to them from the PC, transfer content, and share app activity from the paired smartphone. The app was launched two years ago along with the Galaxy S6 and Galaxy S6 edge. Windows Store says its not currently available? I have a surface 3 pro. Have they started supporting other win 10 devices yet and not just the Samsung tab pro? how does it work? bluetooth? nfc? wifi?